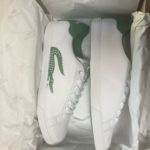 British footwear manufacturer Pentland has announced the appointment of Marc Hare as the new product director of the Lacoste Footwear Joint Venture. In January 2018, Pentland and The Lacoste Group announced a 50:50 joint venture (JV) based at the Pentland HQ in North London. The JV manages the design, production and manufacturing of Lacoste’s footwear globally. Pentland continues to manage UK distribution, while Lacoste handles distribution in its main territories. Hare joins the business after having run his own successful streetwear inspired sneaker brand, Mr.Hare, since 2008. Hare will be leading the new ‘Mainline’ and ‘Future Concepts’ product teams and working with Lacoste JV CEO, Gianni Georgiades, to support Lacoste’s vision for the future of the brand. He will join the business from 10th September 2018. This entry was posted in Designers, Lacoste, Shoes and tagged Footwear, Lacoste, Marc Hare, Shoes by JFP. Bookmark the permalink.